FREE ESTIMATE. To buy, auction, sell or consign your Gus Grissom autograph that is for sale, please email Nate@NateDSanders.com or call the Nate D. Sanders Auction House (http://www.NateDSanders.com) office at (310) 440-2982. 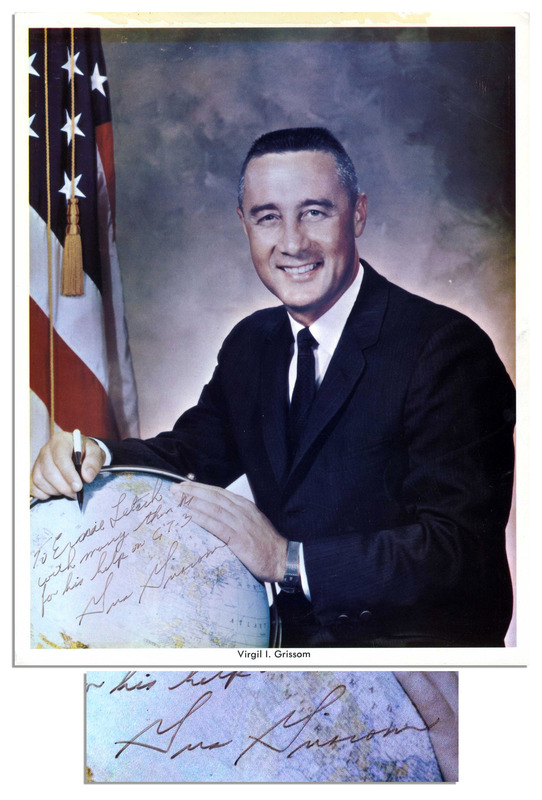 Please let us know if you have a Gus Grissom autograph that is for sale. Top dollar obtained for your Gus Grissom autograph. Gus Grissom was an American astronaut who took part in NASA’s Liberty Bell 7 and Gemini 4 where he experienced flying in space. He was selected for the Apollo 1 mission, but tragically died in a fire during a test launch with astronauts Ed White and Roger Chaffee. 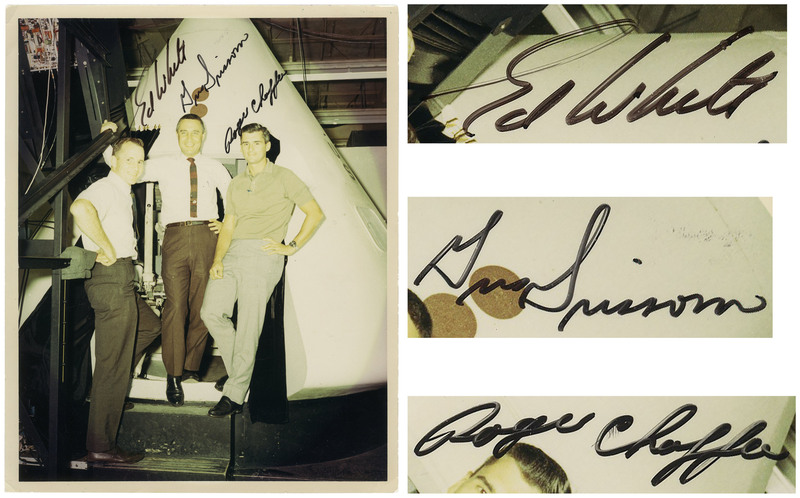 We recently sold a Gus Grissom autograph, as well as several Ed White autographs. Details of the items are below. Gus Grissom Signed 8″ x 10″ Photo — Rare Single-Signed Photo of Astronaut Killed in 1967 Pre-Launch Test for Apollo 1. Sold for $679. Gus Grissom signed photo. Inscription in Grissom’s hand reads in full, “To Ernie Letsch with many thanks for his help on G’T-3 / Gus Grissom”. A member of the original Mercury Seven, Grissom was the first NASA astronaut to fly in space twice, and sadly, one of three astronauts to be killed during preparations for the Apollo 1 mission. 8″ x 10″ semi-matte photo is in very good condition. 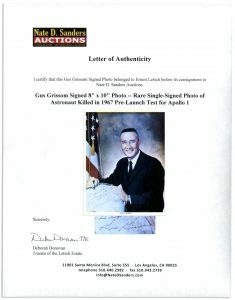 Gus Grissom Autograph 8″ x 10″ Photo — Rare Single-Signed Photo of Astronaut Killed in 1967 Pre-Launch Test for Apollo 1. Click to enlarge. Gus Grissom Autograph 8″ x 10″ Photo COA. Click to enlarge. 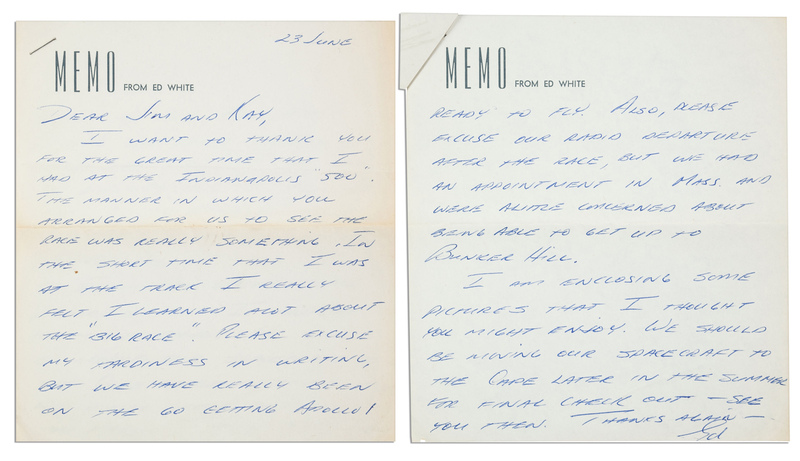 Ed White Autograph Letter Signed to NASCAR Racer Jim Rathmann — ”…Please excuse my tardiness in writing, but we have really been on the go getting Apollo 1 ready to fly…We should be moving… Sold for $1,086. NASA astronaut Ed White autograph letter signed on “Memo from Ed White” stationery, dated “23 June” (no year, but 1966) and signed “Ed”. Addressed to NASCAR racer Jim Rathmann, White discusses the upcoming Apollo 1 launch and thanks Rathmann for a recent Indy 500 visit. Almost 6 months to the day of writing this letter, White, along with Apollo 1 astronauts Gus Grissom and Roger Chaffee would die during a launch test, never completing the Apollo 1 mission mentioned in this letter. Reads in full: “Dear Jim and Kay, I want to thank you for the great time that I had at the Indianapolis ‘500’. The manner in which you arranged for us to see the race was really something. In the short time that I was at the track I really felt I learned a lot about the ‘Big Race’. Please excuse my tardiness in writing, but we have really been on the go getting Apollo 1 ready to fly. Also, please excuse our rapid departure after the race, but we had an appointment in Mass. and were a little concerned about being able to get up to Bunker Hill. I am enclosing some pictures that I thought you might enjoy. We should be moving our spacecraft to the Cape later in the summer for final check out- see you then. Thanks again- Ed”. 2pp. letter measures 6.25″ x 7″, with a staple at top left. one fold and light wear. Near fine condition. Ed White Autograph Letter Signed to NASCAR Racer Jim Rathmann. Click to enlarge. Apollo 1 Signed 8” x 10” Photo by Ed White, Gus Grissom and Roger Chaffee. Sold for $5,000. Photo signed by the three Apollo 1 astronauts, ”Ed White”, ”Gus Grissom” and ”Roger Chaffee”. All three men would die in the fire on 27 January 1967 shortly before the mission was to launch. 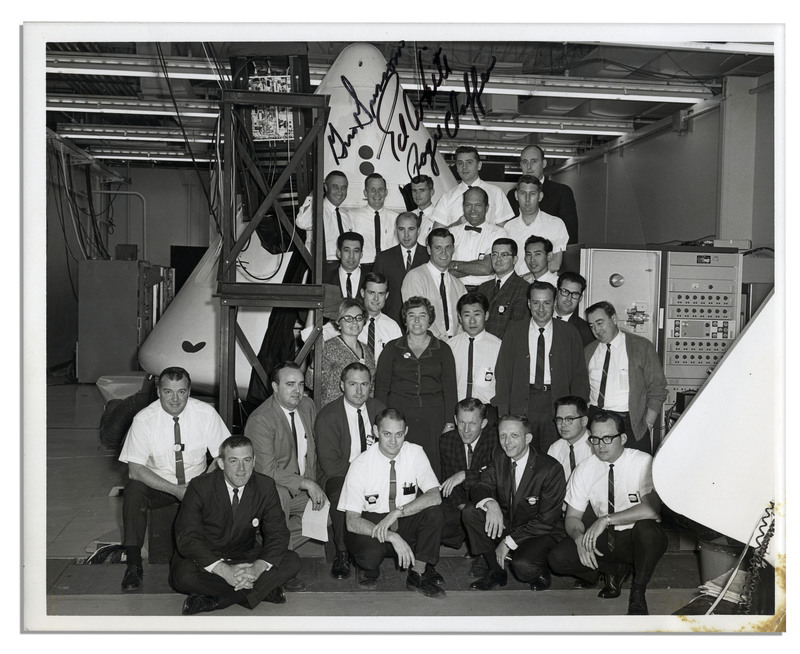 Glossy photo measures 8” x 10”, showing them standing in front of the Command Module. A few shallow creases and light fading to photo, otherwise near fine with bold signatures in black felt tip. From the estate of Daniel Lawrence, Sr., part of the Apollo 1 simulation team. Apollo 1 Signed 8” x 10” Photo by Ed White, Gus Grissom and Roger Chaffee. Click to enlarge. Apollo 1 Astronauts 10” x 8” Signed Photo — Gus Grissom, Ed White & Roger Chaffee — With PSA/DNA COA. Sold for $4,500. Photo signed by the Apollo 1 crew, ”Gus Grissom”, ”Ed White” and ”Roger Chaffee” in black felt tip. Image captures the Apollo 1 astronauts with employees from the Command Module design team at North American Aviation. Glossy photo measures 10” x 8”. Light soiling to lower right corner and light buckling. Near fine. 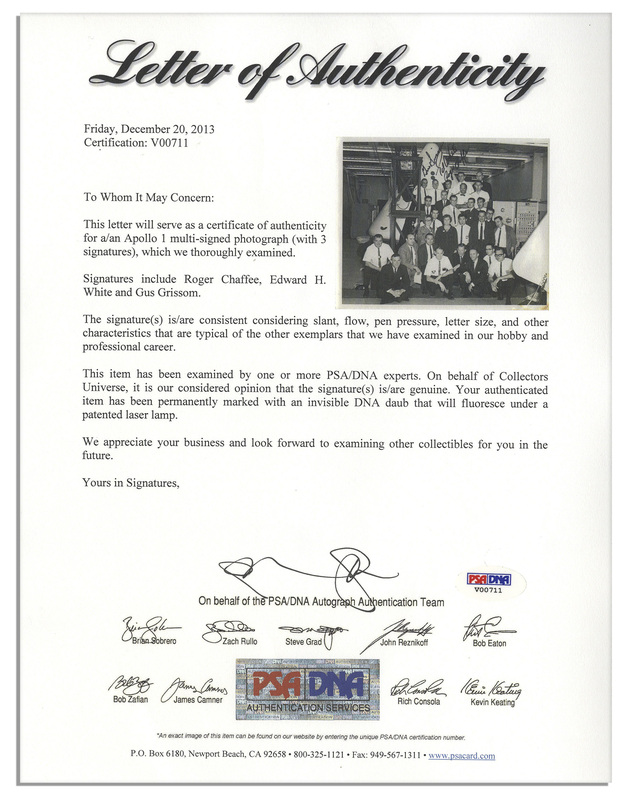 With PSA/DNA COA for all signatures. Apollo 1 Astronauts 10” x 8” Signed Photo — Gus Grissom, Ed White & Roger Chaffee — With PSA/DNA COA. Click to enlarge. 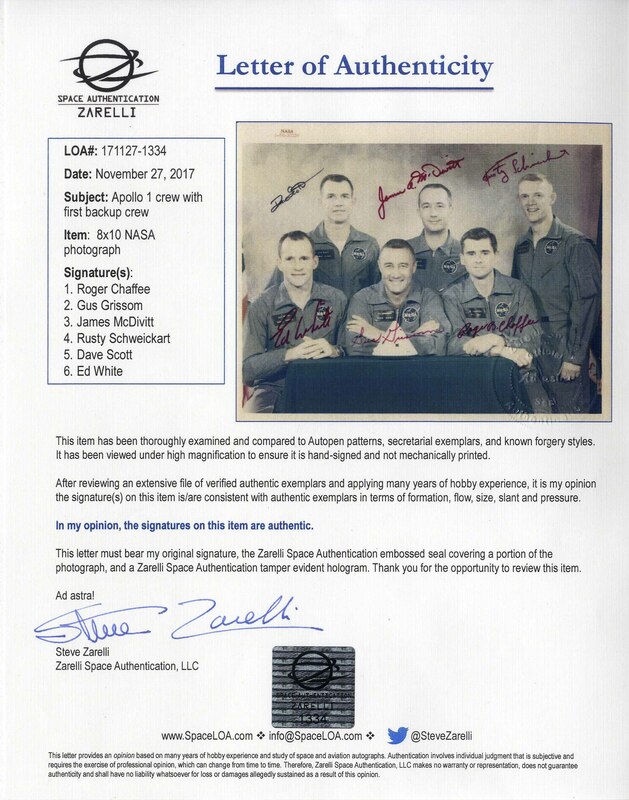 Apollo 1 Signed Photo With All Six Signatures From Primary and First Backup Crew — With Steve Zarelli COA for All Signatures. Sold for $10,000. 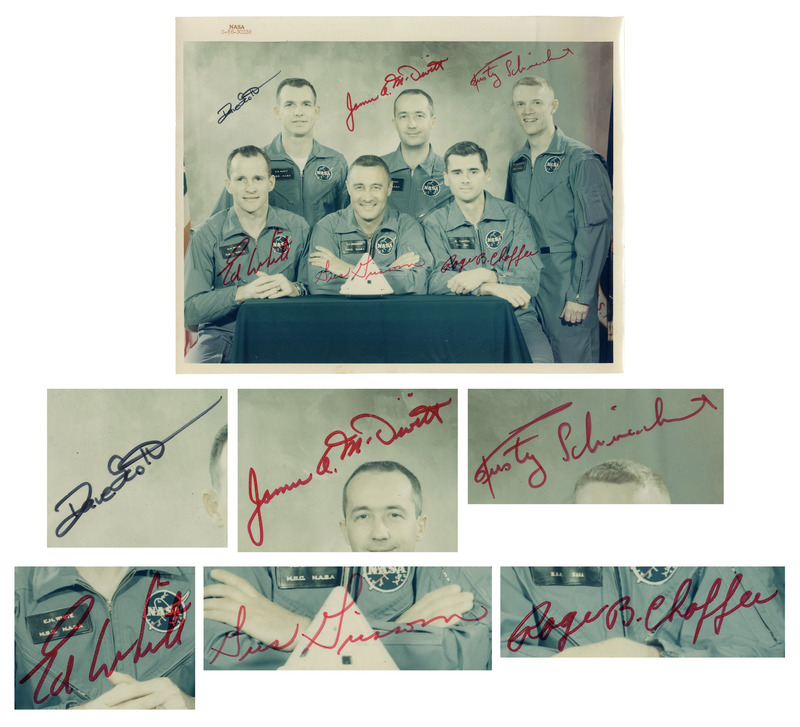 Exceptional Apollo 1 crew signed photo, with signatures from entire primary and first backup crew: ”Gus Grissom”, ”Ed White”, ”Roger B. Chaffee”, ”James A. McDivitt”, ”Rusty Schweickart” and ”Dave Scott” in red and black felt tip. Image captures the Apollo 1 astronauts posing in front of a model of the Command Module in their official NASA blue jump suits. Glossy photo measures 10” x 8”. Faint paperclip impression at upper right and fading to photo, while signatures remain bold and very readable. Overall in very good plus condition. With a Steve Zarelli COA for all six signatures. Apollo 1 Signed Photo With All Six Signatures From Primary and First Backup Crew — With Steve Zarelli COA for All Signatures. Click to enlarge. Edward White Signed 8” x 10” ”Space Walk” Photo, Inscribed With His Famous Quote — ”I could see the whole California Coast”. Sold for $1,250. Signed color photo of astronaut Edward White ”walking” in space, the first man to do so on 3 June 1965. Tragically, White was one of three astronauts who died just two years later, in 1967 on an Apollo training mission. NASA photo is inscribed by White with his musings in space, delighting the whole world at the time: ”Joe / ‘I could see the whole California coast’ Edward H White / 3 June ’65”. Semi-matte photo measures 8” x 10” including off-white photographic border. Photo is stamped upon the border to the upper right ”NASA S-65-30428”. Tape remnant at top and light wear to corners. In very good condition. 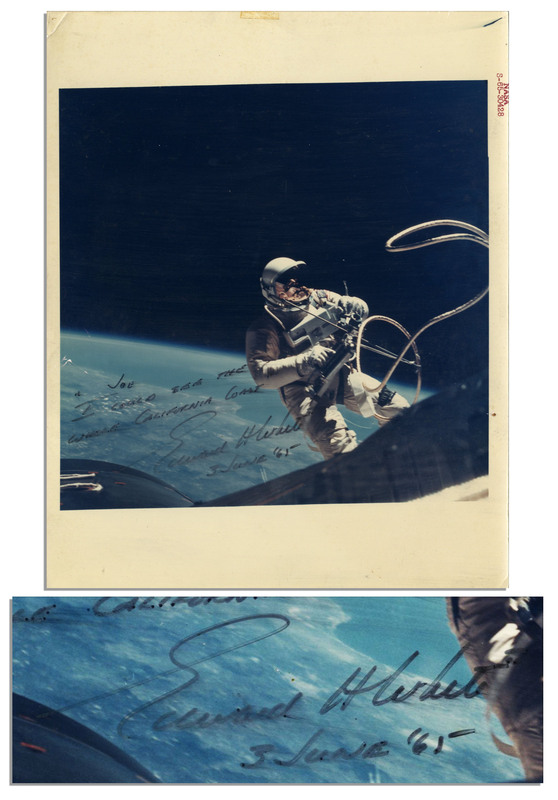 Edward White Signed 8” x 10” ”Space Walk” Photo, Inscribed With His Famous Quote — ”I could see the whole California Coast”. Click to enlarge. 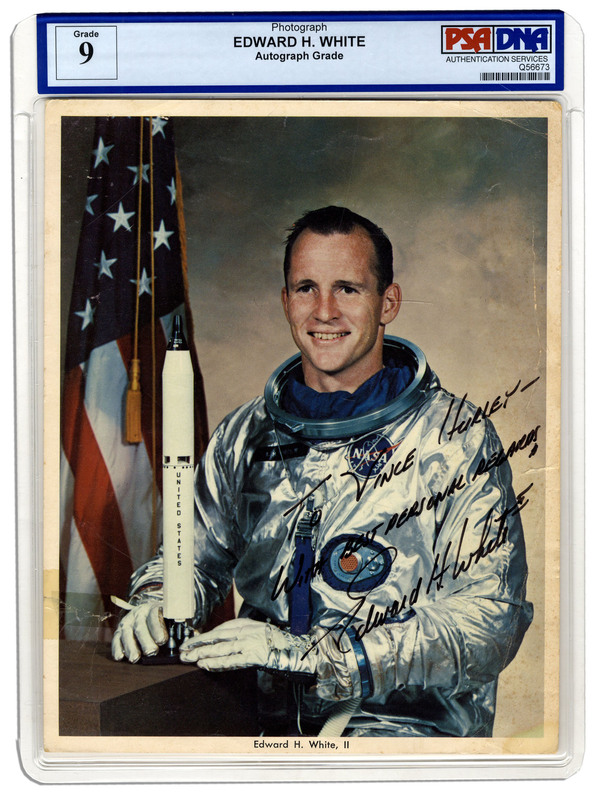 Rare Astronaut Edward White Signed 8” x 10” Photo — With PSA/DNA COA — Strong, Bold Signature. Sold for $756. Astronaut Edward White signed 8” x 10” glossy photo. White, the first American to walk in space during the 1965 Gemini 4 mission, was one of three astronauts, along with Gus Grissom and Roger Chaffee, to die tragically in a 1967 fire aboard the Apollo I spacecraft as it prepared for flight, making this signed photo especially scarce. He signs, ”To Vince Hurley / With best personal regards / Edward H. White”. Moderate creasing and tape repair to 1” tear, else very good. Encapsulated and signature graded 9 by PSA/DNA. Rare Astronaut Edward White Signed 8” x 10” Photo — With PSA/DNA COA. Click to enlarge.